What I expected from a movie called The Singing Detective was a gumshoe musical, whatever that might look like. And although that description fits — there are musical numbers, lip-synced by the cast, and there are pulp-novel cliches — it’s not the right one. 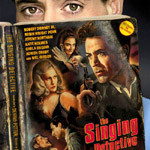 The Singing Detective (adapted from a TV miniseries) is a psychoanalytic trip through the mind of a writer. It’s set in the modern day. Dan Dark (Robert Downey, Jr.) is recovering from a disfiguring burn. His fever dreams are Freudian flashbacks to a childhood he has confused with his own pulp crime novel called “The Singing Detective.” Mel Gibson dons a bald pate and googly glasses to portray Dr. Gibbon, a psychiatrist who helps Dark work through his problems. Whatever a “gumshoe musical” might have been, it probably wouldn’t have been nearly as interesting as this movie is. The Singing Detective is layered, substantive, and thought-provoking. It is a movie to talk about with friends afterwards.